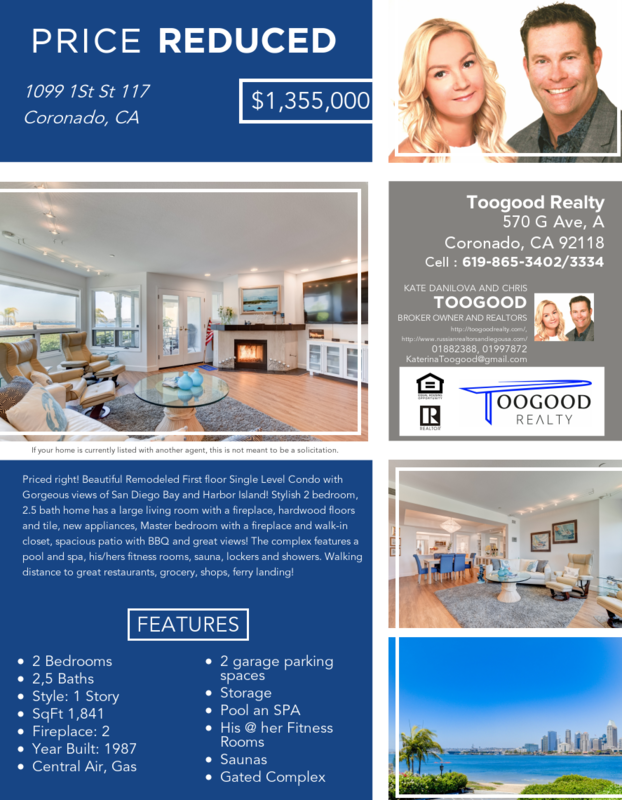 OUR LISTING in Coronado! REDUCED PRICE! ​Friends, check out our listing! REDUCED PRICE ????! Beautiful Remodeled First floor Single Level Condo with Gorgeous views of San Diego Bay and Harbor Island! ???? Stylish 2 bedroom, 2.5 bath home has a large living room with a fireplace, hardwood floors and tile, new appliances, Master bedroom with a fireplace and walk-in closet, spacious patio with BBQ and great views! The complex features a pool and spa, his/hers fitness rooms, sauna, lockers and showers. Walking distance to restaurants, grocery, shops, ferry landing. Enjoy the resort feeling! Price is $1,355K, SqFt 1,841. 1099 1st St, 117, Coronado, 92118.